I went and did the coolest thing ever on Saturday. My husband and I are friends with another couple named Jay and Tati. Jay's cousin has a farm, with goats. I love goats. I beg my husband regularly to let me have one or a dozen. They are super cute and generally friendly. He keeps telling me we live in a town house and don't technically have a yard so I can't have one. I would totally sod our deck for a goat. Tati and I made the hour trek to farm to see the baby goats. Yup, not just full grown adult goats but babies, 28 of them. And I got to feed them. This made me a happy girl. As soon as you get in the pen with them they swarm you. They were sucking on my coat, jeans, shoes and even my fingers if I let them. They were very excited to see us. Moving goats are hard to photograph with just your iPhone. They were so tiny and cute. They are all bottle fed three times a day. This makes them much more friendly. Man, they can drink fast too. This is one of the yearlings. She was born last year. There were still about 35 mamas that hadn't given birth yet. So there will be more babies soon. The babies we were feeding were about two to three weeks old. I wanted to put one in my car and take them home. I know I would get in so much trouble if I did. Saturday was also the first day I ran since my stomach bug. What a crappy run. I guess my body needs more fuel than saltines, plain brown rice and tea. Hopefully this week will be better. My right calf is a little tender. I am hoping it will feel better for tomorrow. I have a 45 minute date with the treadmill in the morning. So, I started a new kind of cross training this week, Krav Maga. It is not only a great workout, it is self defense training. I am going with my friend Amy. 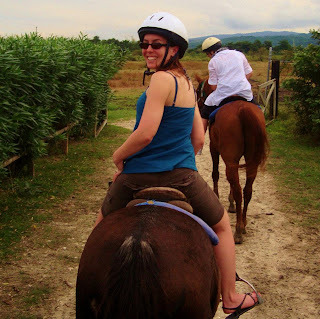 Our first lesson was a semi private lesson (just me and Amy) with the owner. We learned a couple of punches, a groin kick, and some knee to the groin action. We also learned how to hold the pads for each other so that we wouldn't get hurt. It was a very fun and enjoyable experience. We signed up for a 6 week trial period. We got some karate bottoms and at tee shirt to wear as our uniforms. Yesterday we did our first group class. I have had a stomach bug for the last couple of days and was not able to go either Wednesday or Thursday. :-( Feeling a little better today, so that is great. Last night was not much in the way of Krav Maga but a lot of cardio. Normally I would not mind so much cardio. But the fact that I have been living on saltines, graham crackers and tea made it a little difficult. I just don't have a lot of energy. Good news is that I didn't puke. Bad news is that everyone in the class things I am slow and a sissy. That's cool. I have five more weeks to change their minds. There was a lot of ab work, arms using a kettle ball (which I have never ever used before), squats, running up stairs and punching a pole. It was a pretty good workout. My abs do not feel worse for wear, I do Pilates fairly regularly. 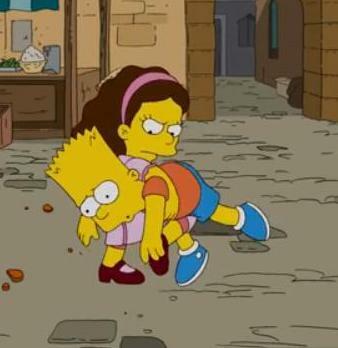 My arms are killing me though. I am glad to also be learning a little self defense. It sounds like the classes the rest of the week are more technique then cardio. I have been a little nervous running out in the community since I heard about SUAR's cousin's abduction in Montana. 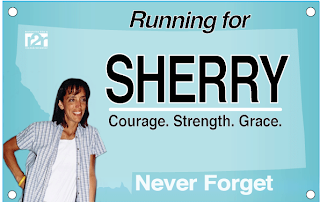 I will be doing the virtual run for Sherry next Saturday February 11th. 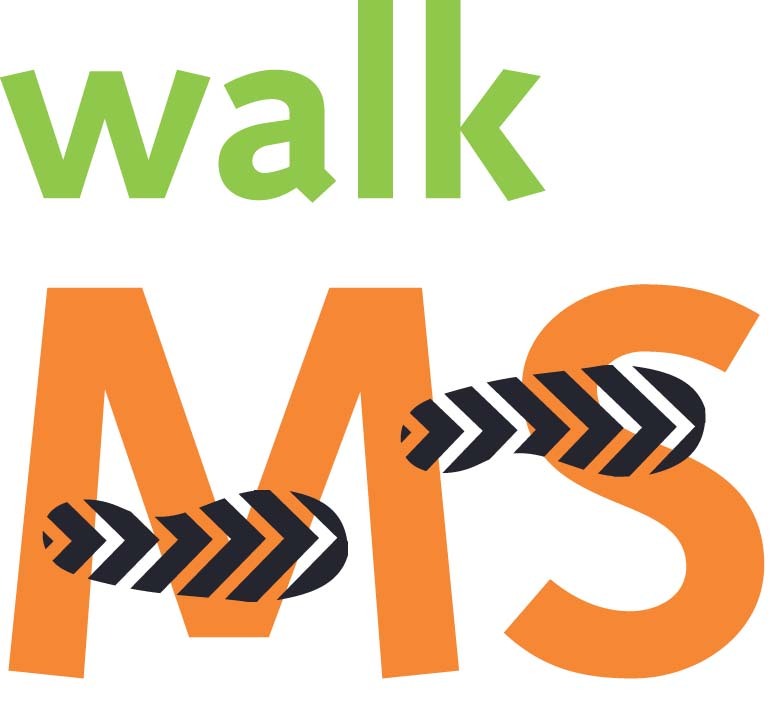 This is a great cause and there is a place to donate to Sherry's family on SUAR's website. You can print out your bibs for it here. Well, it was bound to happen at some point. I went for a 5 mile run on Saturday morning. I like to leave my longer runs for the weekend when I have some serious time to devote to them. 5 miles in not an incredibly long run for me but I am in that transition period between training for a half marathon and a full so I wanted to get out there but not go for any distance records. (I am starting my Marathon training on Tuesday, tomorrow. I am super excited about it.) This is the first time in 3 weeks that I have run outside. I have been doing the treadmill most mornings. And it felt great to be in the great outdoors. It was a little icy out and about 31 degrees when I left the house around 8:30am. I thinking that I really should be extra careful on the ice. I was doing pretty well until mile 3. I don't even think that it was the ice that got me. I have been running on the sidewalks for the last couple of months. I am trying to stay in well populated areas of my town since I run alone most of the time. I think that I caught the tip of my sneaker on an uneven part of the sidewalk. I had a very surreal moment as I was starting to go down. I am not graceful at all and I don't fall that way either. 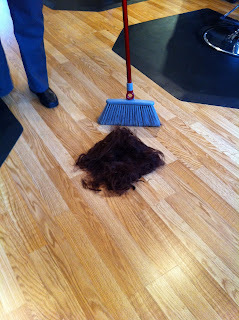 I am sure I had my arms flailing and a pained look on my face. I really thought for a moment when I was about half way down that I was going to recover and just look like a fool for stumbling. But then reality hit or maybe it was just the concrete. I landed first on my right knee then both hands and finally the right side of my bum. Thank god for the cold weather because I had a ton of layers on. I have a little road rash on the knee and a small bruise, my hands were only a little red because of the gloves and I have a baseball size bruise on my right bum cheek. Not too bad for a tumble. What I really hurt was my pride. I took a quick look around to see if I had any witnesses. I didn't see anyone. Great, no one to point and giggle. The rest of my run was much slower. I was a little more cautious now and my bum kinda hurt. All in all I am no worse for wear. I am surprised I don't fall more often to tell you the truth. I really am not the best with balance. I had a good laugh over it with my husband when I got back to the house. Still it was nice to get outside and run. I am glad the New England weather has been so mild. It has made training much easier. I would be lying if I said I was a little freaked out about running outside by myself lately. After hearing the horrific story of the abduction of Sherry Arnold and reading about the pain her family is going through on SUAR's blog I am a little hesitant to lace up my shoes and head out in my community. I generally run alone in my neighborhood. It is suburban with light traffic and generally there is always cars and people about. I am still a little apprehensive. I like to run while listening to books on tape. I know what I shouldn't wear headphones while I run so that I won't look like an easy target but when I run for hours at a time I need a little something to distract me. I generally run with mace on my belt but I have read mixed things about if that is a good idea. I was talking about my feelings about running outside with one of my best friends Amy yesterday and we came up with a plan. We are going to try Krav Maga. We found a place fairly close to our work. It looks like it is reasonably priced. We are going to check out their free woman's self defense class this Friday. I think that if I feel like I am reasonably able to protect myself I might be more at easy getting back to my routine. I start my 15 week marathon training next week and the thought of running 20 miles on a treadmill is a nightmare. I wish that I could find a running group near my house that runs as slow as I do. The only one that I have found near by trains at an 8 minute mile. I think I could do one 8 minute mile but that is definitely not a training pace for me. 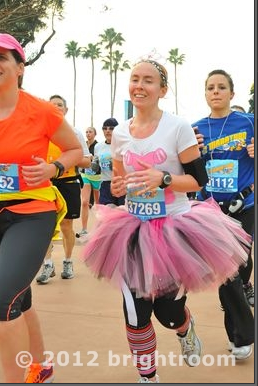 I am more of a 12 minute mile kind of girl. 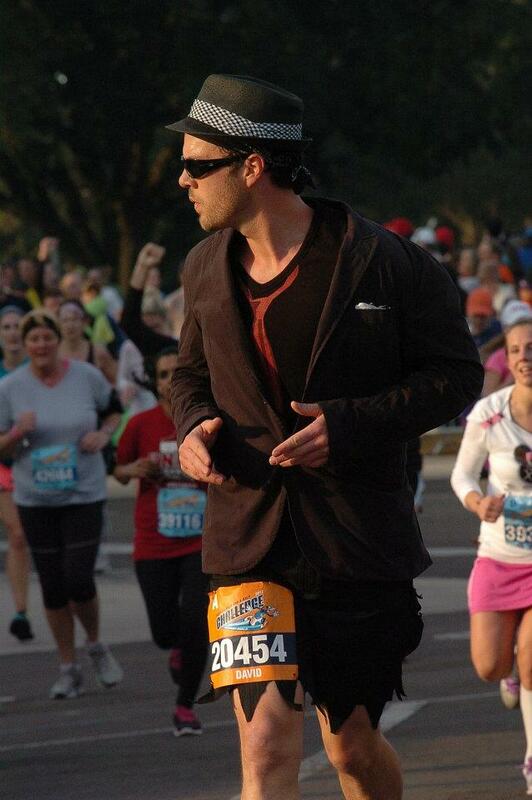 Slow I know but I am happy that I can get out there and run with all of my medical issues. What are the rest of you guys doing for protection? Am I the only one nervous getting out there and running alone? 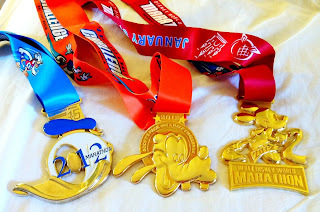 After running the Disney World Half Marathon my husband and I along with two other couples went on a Royal Caribbean cruise. 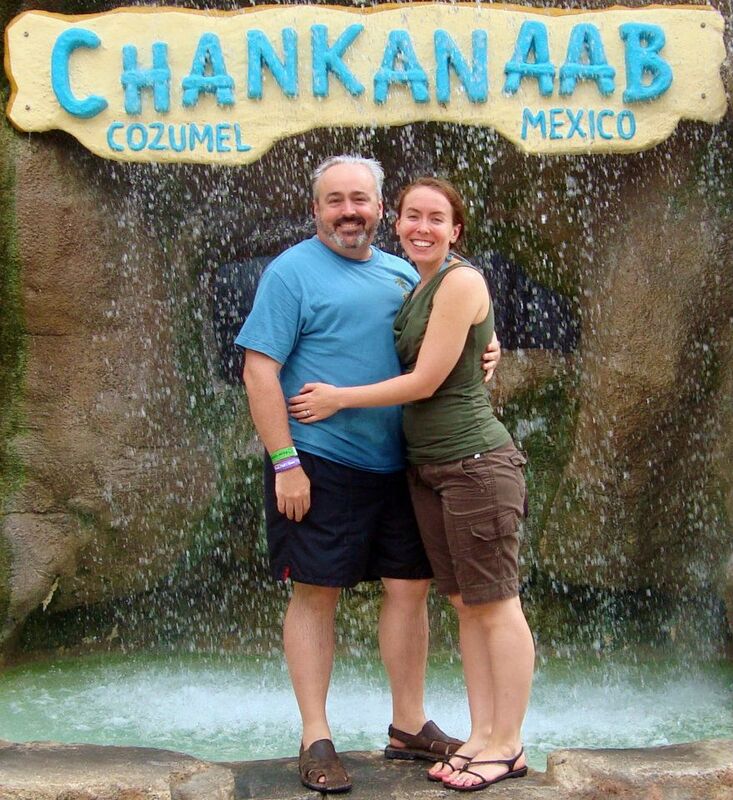 It stopped at Labadee Haiti, Falmouth Jamaica, George Town Grand Cayman, and Cozmel Mexico. It was a great time. We eat and drank way too much. We had fun in the sun. 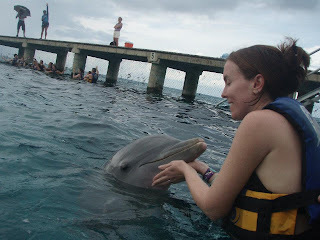 And I got to meet a variety of animals along the way. In Haiti we just did a beach day. The water was great. We got to lay in the sun (with 70 SPF sunscreen) and splash in the ocean. 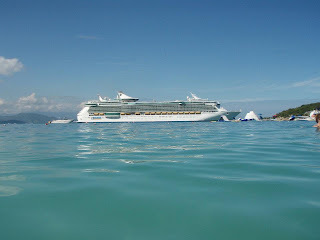 Here is a view of our ship the Freedom of the Seas. 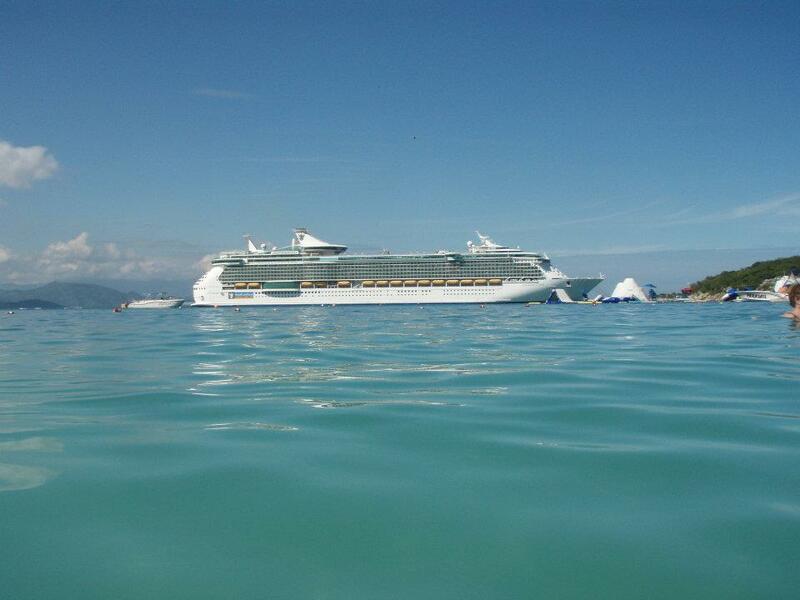 My husband took this from while swimming in Haiti. 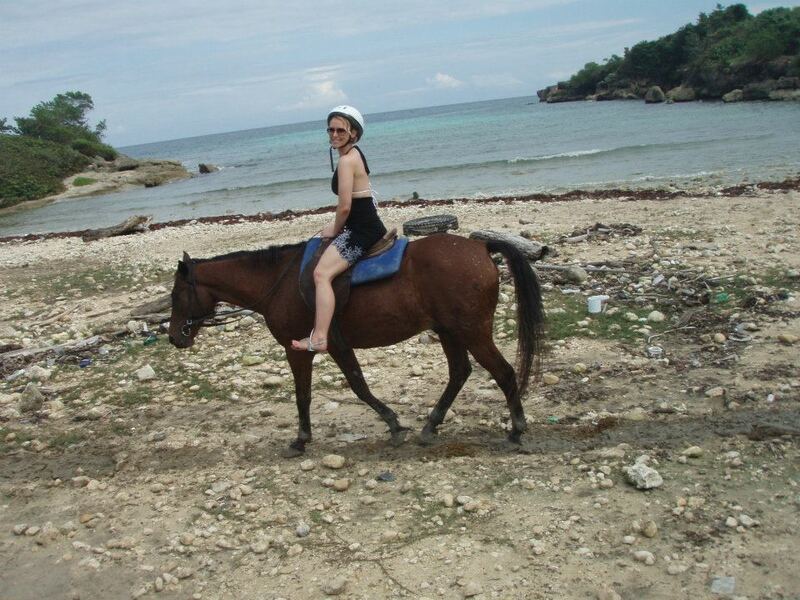 In Jamaica we went horseback riding. I have only done this once before but I was game for a little adventure. I was pretty dead set on not getting off the boat in Jamaica because my previous experiences there were not great. I am glad that my friend Paige was able to talk me into it. 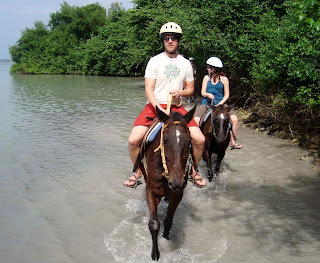 We first went for a trail ride and then swam in the ocean while on horse back. Here I am on our trail ride. 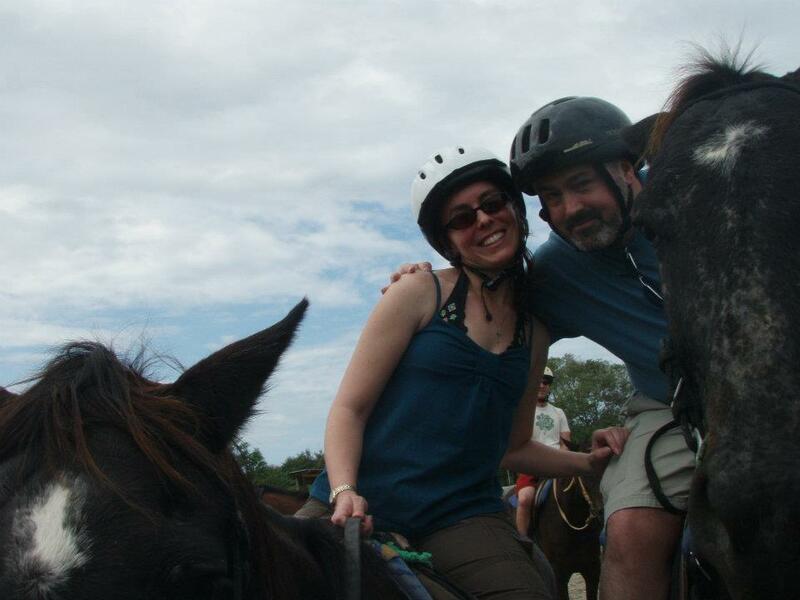 Our friend Dave and I riding on the beach. Dave's girl Erin riding on the beach. We bought the pics of us swimming but I don't have them yet. I will try to get them posted as soon as I do. 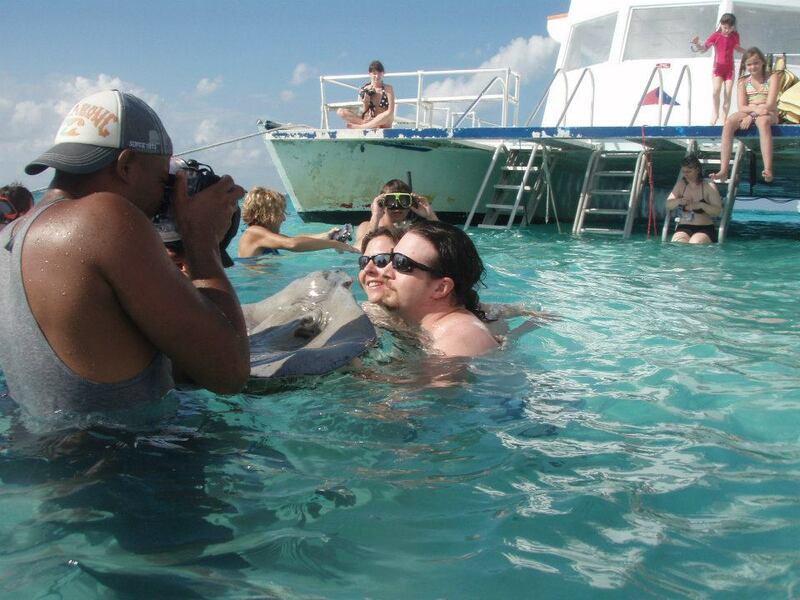 Our next excursion was in Grand Cayman where we swam with the Sting Rays. I am a big fan of this excursion. 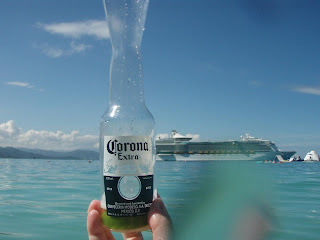 We did it last year on our last cruise and had a bunch of fun. We decided we wanted to do it again. Eric and I did not buy our pictures from the swim this time. 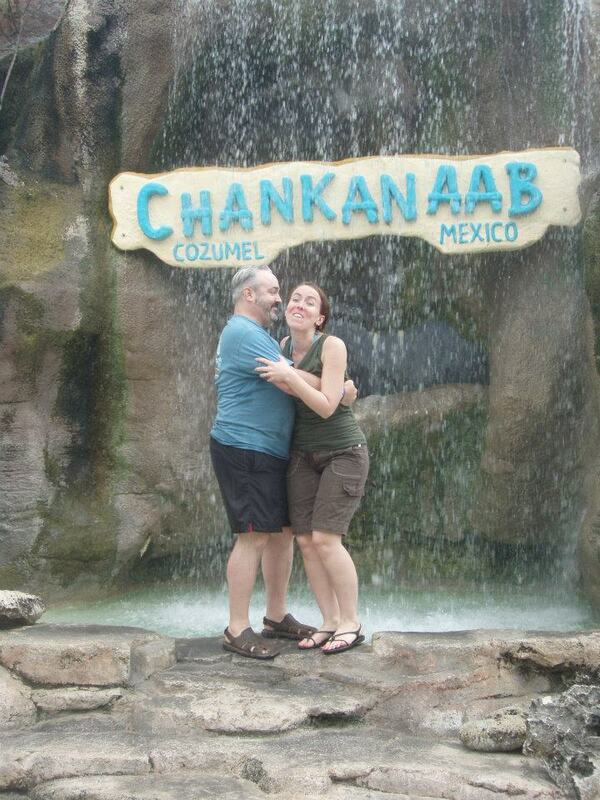 We bought them last year and I decided that neither the two of us or the sting rays had changed much. Here is a photo from last year of me and my husband with the sting ray. These guys were super friendly. 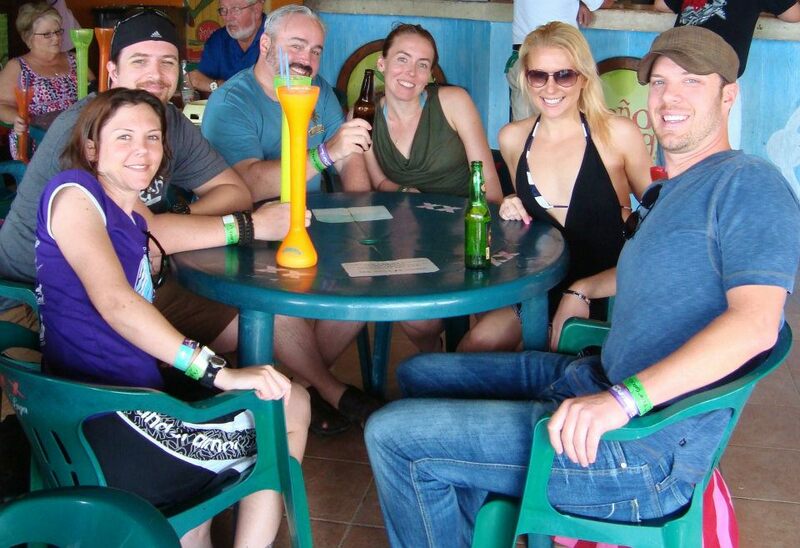 They all show up at this sandbar in the Grand Cayman because they know they will get an easy meal. 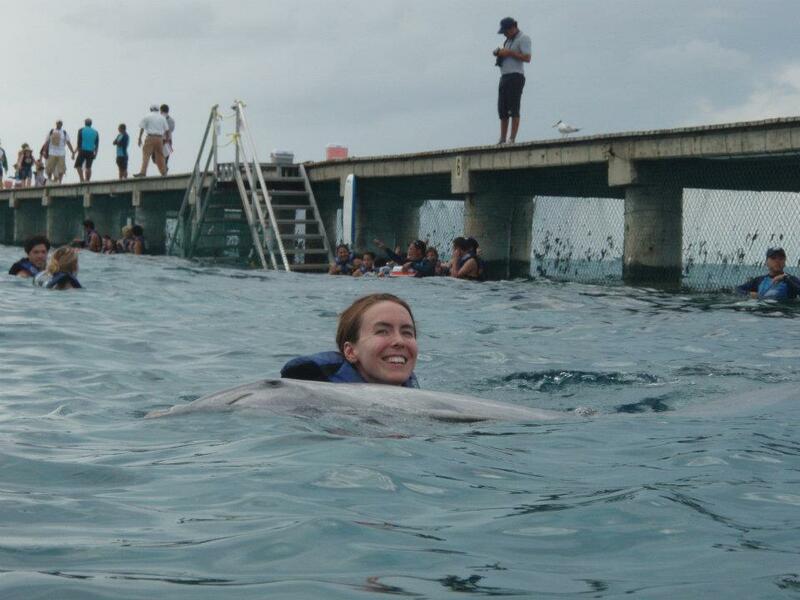 They swim right up to you and let you pet them. We then got to snorkel at a reef that was close by. Our last adventure was in Cozmel Mexico. 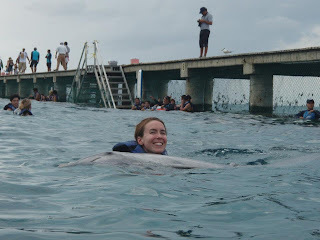 We swam with the dolphins. Our Dolphin's name was Freda. She had a very cute pink belly and was very sweet. This was a fun excursion and it was only three miles from the pier. I enjoyed the small travel time. 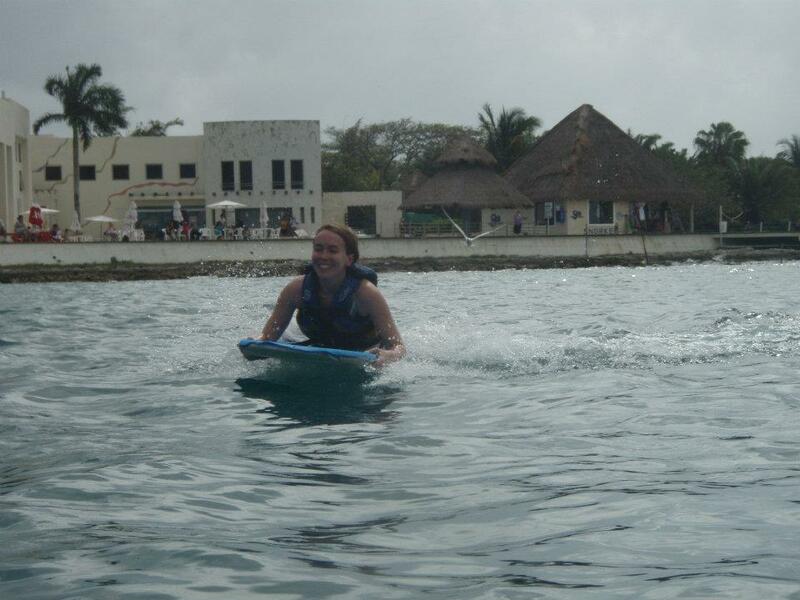 She even pushed us on a boogie board. We got to meet a Manatee too. I had never been in the water with one before. They feel sort of rough and they eat lettuce. That was pretty cool. We stopped at Senior Frogs before getting back on the boat. It was quite a place. They had music rocking the whole time. Our waiters even got up and did a dance for us. Dave's girl Erin is from Ohio. The table next to us were also from Ohio. Apparently this is a thing there. We are spelling Ohio. Before the nice picture of us he tried to throw me in the fountain. He is lucky I love him so much. the reality of snow and cold. 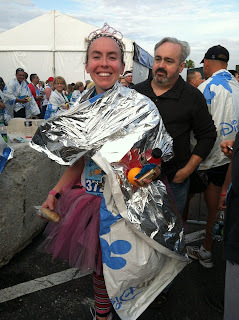 Disney World 2012 Half Marathon! First off, I have to say that I have a pretty wonderful husband. Not only was he willing to give up one of our vacations to fly down to Disney so that I could run but he got up at 3:00 am to drive us to the start line. We flew down to Orlando on Thursday night. We got in around 10pm. We collected our friends Amber Lea and Paulie and our luggage and got our rental car. We grabbed a quick dinner at TGI Fridays and happily checked into our condo at 12am. I had a pretty good night's sleep and woke up at my normal weekend time of 7am. (I was the only one in the condo awake at that time) I got to enjoy my coffee and a Luna bar and some HGTV. 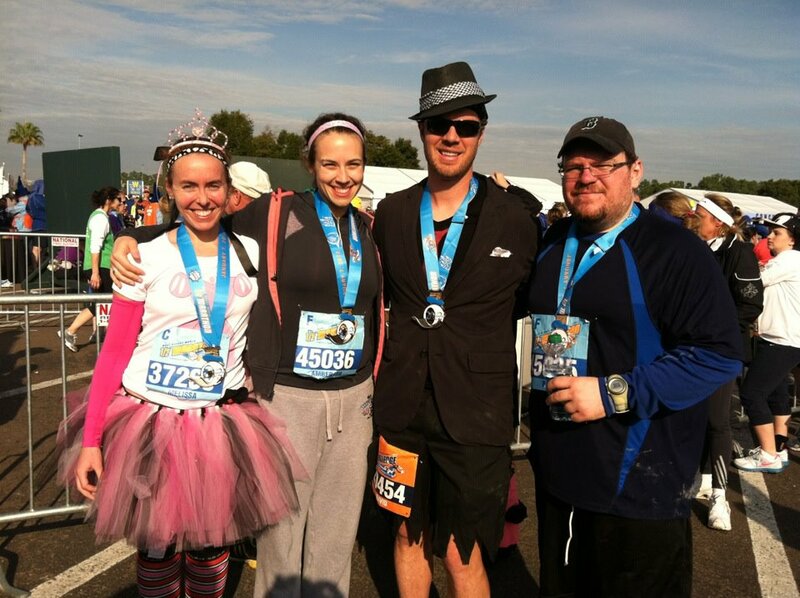 Once the gang got up Amber Lea and I took a 2 mile run. 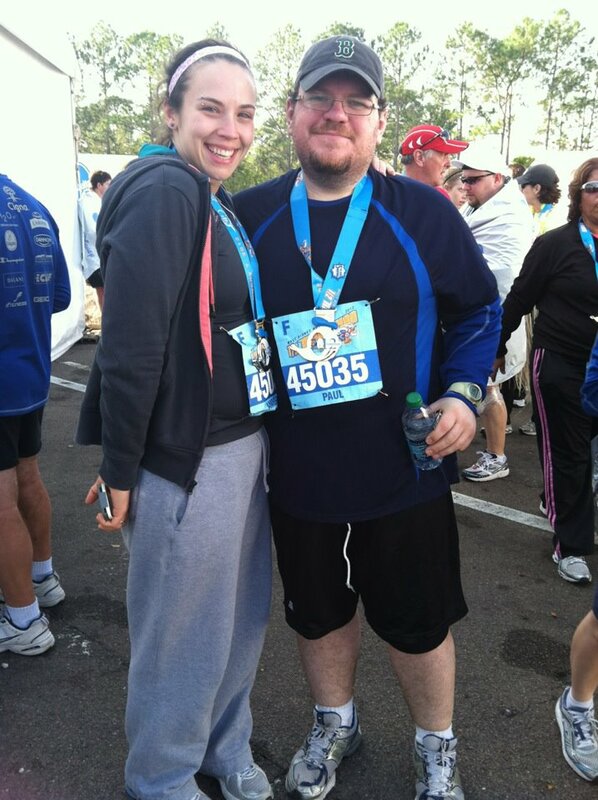 It was on her half marathon training schedule and I really wanted to acclimate my body to the Florida weather. I have been running all of my runs in the New England winter climate. Granted it has been a mild winter but it is a heck of a lot colder then Florida. We finished in about 32 minutes, not bad considering both of us agreed the humidity made our legs feel like lead. Then we were off to breakfast and the expo to pick up our race packets. The expo was stupid crowded. I didn't take any photos because I don't think I could get my arms up to do it. The goodie bags were pretty lame this year. There was a mini cliff bar in it and a bunch of advertisements. The shirts were pretty awesome though. We had dinner Friday night at the House of Blues. I had the pasta of course. Got to load up on some carbs. We got to bed pretty early. The 3 am wake up call is a little earlier than my regular 5am. I didn't have any trouble sleeping. Last year I was a bunch of nerves. My hubby dropped us off at the meeting point for the half marathon and we began our (what felt like) 4 mile trek to the start line. We lined up in the corral that was third from the back. I was placed in the third corral and my friend Dave was in the first corral but we all wanted to stay together and because Amber Lea and Paulie haven't raced before they were in a later corral. I think the race went well. Dave, Amber Lea and I stayed together for the first 6 miles. I am slower than the two of them so I told them to go ahead of me once we reached Magic Kingdom. Paulie had us go ahead of him at the start line. There were a lot of people racing, which I expected since there was a lot of people last year. There was a lot of bobbing and weaving to get around slower runners. I kind of wish slower runners would stay to the right. I didn't stop for pictures with any of the characters. I wanted to beat my time of 2:38:10 of last year. I was hoping to break 2:30 this year. I ended up with 2:31:48. I shaved almost 7 minutes off my time. I am pretty proud of that. Amber Lea and Dave finished about 10 minutes before I did. And Paulie finished a little under an hour after I did. 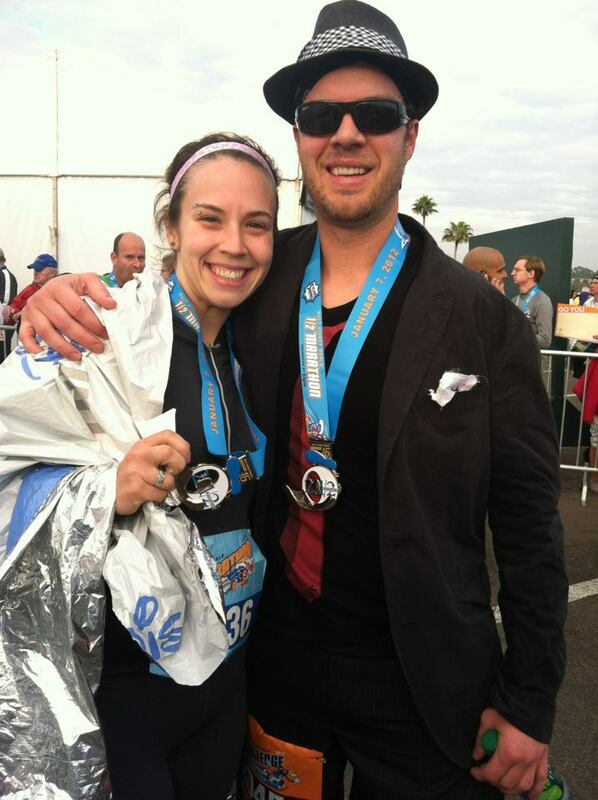 I am very proud of both Amber Lea and Paulie for training and finishing the half marathon. It is quite an under taking. It is a big commitment. Me and my husband, not sure why I am getting such a dirty look. Dave in his costume for the race. Me in my race costume. Totally proud of Dave too. He did the Goofy challenge this year. This is when you run the half marathon on Saturday and then the full marathon on Sunday. That's 39.3 miles in two days. He rocked it. All three of Dave's medals. What's next for me? I signed up to do the Providence Full Marathon on May 6th of this year. A new round of training starts in a week and a half. I am hoping to finish it in five hours.